A highlighted feature on the farm is its innovative water management project, known as the Pratt Farm Project. This nationally recognized and award winning project helps keep our waterways clean and healthy. The project was a collaborative effort with federal, state and local governmental agencies and community volunteers. The goal of this project was to demonstrate the ability to maintain productive Agriculture lands through effective water management while maximizing environmental resources. One of the most important functions of the project is its education/demonstration component. The main purpose of this project is to demonstrate to the agriculture community, agency personnel, environmental groups and the general public that agriculture drainage/wetlands and wildlife can coexist. Demonstrating this function was accomplished by utilizing traditional as well as many innovated construction techniques. Many of the construction techniques used were on a first time experimental basis while others were refined for future technology transfer. The original drainage channels on the farm were constructed during the civilian conservation corps era and have deteriorated to the point of minimal function. The decrease in function has resulted in poor drainage and often prohibited harvest in some areas. This project consists of the reconstruction of approximately one mile of drainage channel, ten acres of wetland creation/restoration, and fifteen acres of forested wetland enhancement. The project has employed traditional construction techniques as well as many new innovative methods for channelization and wetland restoration. Approximately 2500 feet of channel constructing has been performed utilizing techniques to minimize disturbance to the forested areas and hedgerows. Mechanical mowing and hand clearing were performed in or to prepare the area for excavation. In this are any trees or shrubs that could be worked around were spared. 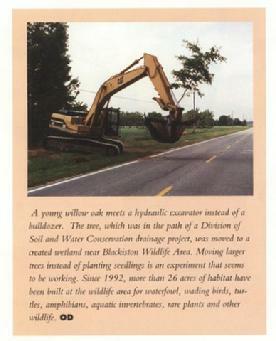 Most of the beneficial trees, which were in the construction zone were moved (via Backhoe or excavation) to the wetland portion of the project. This has resulted in a unique constructed agriculture channel in which habitat, buffers, canopy, etc have remained. Another section of the projects involves the construction of 1200 feet of channel utilizing a geomorphic approach. This portion involves abandonment of the historic channel and construction (in an existing agriculture field) a 20� � 40� wide flood plan with a sinuous low flow channel were shaped to replicate natural conditions rather than traditional straight channels. The main goal of this approach is to shape the channel in a fashion that will produce long term stability thereby reducing maintenance. A more traditional channel (approximately 1,000 feet) was constructed in the upper portion of the section. The wetland restoration portion of the project was accomplished by constructing a series of wetland complexes in agriculture fields. These marginally productive agriculture areas have been restored to shallow freshwater wetlands by excavating the area to a depth ranging from 2 inches to 3 inches. Gentile side slopes allow the wetland to blend into the topography. Micro topographic complexity has been performed to provide diversity to the plant and animal communities. Trees and shrubs in the channel construction zones as well as emergent plants from adjacent sources have been moved into the wetland complexes. The wetland complexes have been situated in the landscape to allow agriculture runoff to enter the wetland for sediment and nutrient reduction to the downstream areas. Most of the project area has been enrolled in the U.S.D.A Conservation Reserve Program. Planting buffer strips adjacent to all channels and wetlands for wildlife, habitat, soil stability and nutrient uptake should result in improved water quality in downstream estuaries. Two water control structures have also been installed in the channelization portion of the wetland area. The final phase of this project was the planting of approximately 1200 trees, shrubs, emergents and forbs in the wetland areas as well as the geomorphic channel area. This task was accomplished with the help of several agency personnel, their friends, children, environmental groups, Dover High School science class, Future farmers of America, members of the Smyrna Clayton Little League etc. The plant species (approximately 30) were selected for their wildlife habitat ad food values as well as soil stability functions. 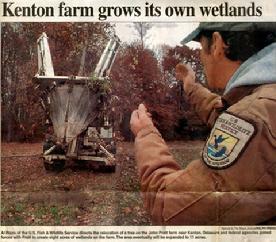 � Relocating larger trees and shrubs (5� to 15� tall) into wetland geomorphic flood plain. � Relocating emergent wetland plants into the wetland (i.e. woolgrass and soft rush). � Introducing organic matter and or course woody debris into the wetlands. � Micro and macro topographic complexity. � Constructing hummocks in the wetlands. � Low cost pvc water level control structure. � Positioning the wetland in the landscape for maximum water quality benefits. � Visiting reference wetland and channels to visualize and replicate natural conditions. � Irregular perimeter shapes and variable bottom elevations in the wetlands. Planning design construction and completing of this project has been the result og the cooperation of many partners which are listed below. This project has been the focal point for numerous tours held for various individuals and agencies. The examples and techniques used her have been transferred throughout the northeastern United States. The work here will be duplicated in New York State as the Niagara county Soil and Water Conservation District implements as environmentally friendly channelization program. The wetlands restoration portion of this project is being used as an example for constructing 800 acres of mitigation in Virginia. Listed below are agencies who have visited the project. The Pratt Farm Project has received national recognition and awards. � Nominated for the 1998 National wetlands Awards Program sponsored by the Environmental law Institute, U.S.D.A, U.S. Fish and Wildlife Services and the National Marine Fisheries Srvices. This project was features at the Delmarva Chicken Festival, Delaware state fair, University of Delaware � Delmarva farm and Home Field Day and the Central Delaware Wildlife Expo.